Barbara Walters is missing. It’s been about a week and I haven’t seen her in the newsroom at all. I checked the sign out sheet but, according to the clipboard, the last time she left the room with a staffer was months ago; I know that’s not accurate. I sent an e-mail asking if anyone knew her whereabouts and suggested they bring her by, but there was no response. So I open the app on my phone — the one that tells me where the cameras are — click on an icon, and in seconds I read “Searching for Barbara Walters” on the screen. It’s not long before I get an e-mail notification: “Barbara Walters has been found.” She’s at a staff member’s house. Now, I know who to contact to get our camera back. 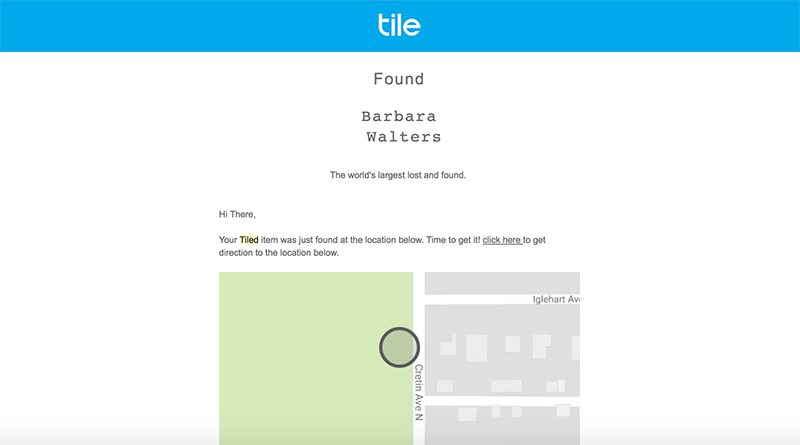 This is the magic of Tile, a little Bluetooth tracker that finds important things. After doing some research and noting that Tile is a recommended product (with 4-star ratings or higher) at Tech Advisor, Wired, and Amazon, I purchased a pack of Tile Mates this fall to attach to our DSLR cameras. A single Tile runs $20-30, but in packs, the price goes down significantly; 8 Tile Mates runs under $100. The battery life is guaranteed for a year, and the company offers a program called “ReTile” where they exchange Tiles at a significantly reduced cost, so new Tiles don’t have to be included in the budget every school year. Old tiles are 99% recyclable at e-waste centers, according to the site. Our Tiles arrived within a week, and setup for all the cameras took less than a prep-period. It’s so easy. I started by downloading the app on my phone. This could also be done with a tablet or smart watch, and since you control whether or not the tiles can find you, I see having the app on my phone as a convenience. I placed a Tile beside my phone, clicked the logo on the tile (it plays a little song) and the app linked to it. From there, I added details like the type of equipment, ringtone, and name. 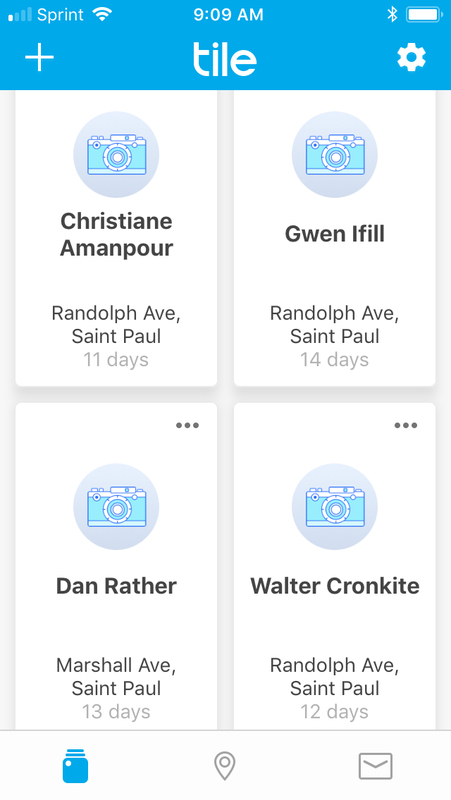 Our Tiles, as you can guess, are named after famous journalists, so if a camera is missing, I know whether to search for Walter Cronkite or Chuck Lane, Christiane Amanpour or Gwen Ifill. From there, I had to decide where the tile would be attached and chose the camera strap. Small carabiner clips or keychains could make this part easier, but I like that the tile is essentially woven into the equipment, so even if a bag gets left behind, the camera body — the expensive part of our hardware — can be found with a click from my phone. The Tiles are more water resistant than our equipment, so even a damaged camera can be found. There are three ways Tiles track the equipment location: by ringing it, searching for it, or through the Tile community. Double clicking a tile will ring the app (if I have location services on my cell) and essentially call me from the camera and will tell whoever has the camera where I am so they can return it. I can also ring the tile from my phone if it is within range (which is about 100 feet). Or, I can click on the app from my phone to ping location services and see (on a map) where the camera was last seen. There’s also a community feature that allows our tiles to ping off other Tile users’ apps and notify me where a lost camera is located. When I explained the new system to the staff, one reporter said, “So, essentially, you can see us wherever we are?” to which, I replied, “Well… only if you have a camera with you,” which isn’t the point. However, it has provided a great incentive to bring cameras back on time. Do we still use the sign out sheet in the publications room? Of course. Do I still log our equipment with the tech department? For sure. But the low cost and ease of installation for Tile has made keeping track of expensive camera equipment easier and reduced the 1-2 week long absences that violate our 24 hour checkout policy for the DSLRs. Barbara Walters may still get lost, but somehow, she always finds her way back to the publications room with Tile. I ordered eight of these after I read this post a few months ago, and, holy cow, thank you so much for sharing this! I had struggled for three years with trying to figure out how to get students to bring cameras back in a timely manner, and having these trackers go off has proven really helpful! Thank you!